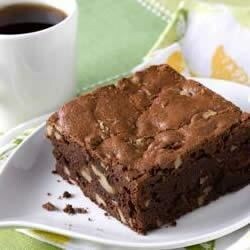 "Walnuts really make the difference with this simple homemade treat. Rich and delicious!" Butter a 9"x9" square baking pan. In a double boiler over low heat, melt butter and chocolate chips together and remove from heat. When the chocolate/butter mixture has cooled a little whisk in the eggs and vanilla. Note: it is important to cool the chocolate/butter mixture or the eggs will cook. Add the dry ingredients and whisk to combine. Bake for 40-45 minutes or until a knife inserted into center comes out clean. I'm 61 years old and these are the best brownies I've ever made!!!! !